In the seventies, Bhutan’s fourth king, Jigme Singye Wangchuck, declared that Gross National Happiness (or GNH) was to replace GDP as Bhutan’s leading economic standard. Wangchuck’s established system of governance suggests the economy should support civic wellbeing, opposing the assumption that a strong economy connotes a happy populace. For instance, if Bhutan’s forests are clear-cut, GDP increases yet the environment suffers and so does net happiness; if rapid modernization is adopted, new infrastructure is built and GDP increases, but the tenets of the dominant Buddhist religion are undermined. Since Wangchuck’s proclamation, attempts by the Bhutanese government (which changed from absolute to constitutional monarchy in 2008) have been made to quantifiably measure happiness—an abstract emotion. The annual International Conference on GNH, which began in 2004, and the nation-wide GNH survey, completed in 2007, 2010, and 2015, are two efforts. 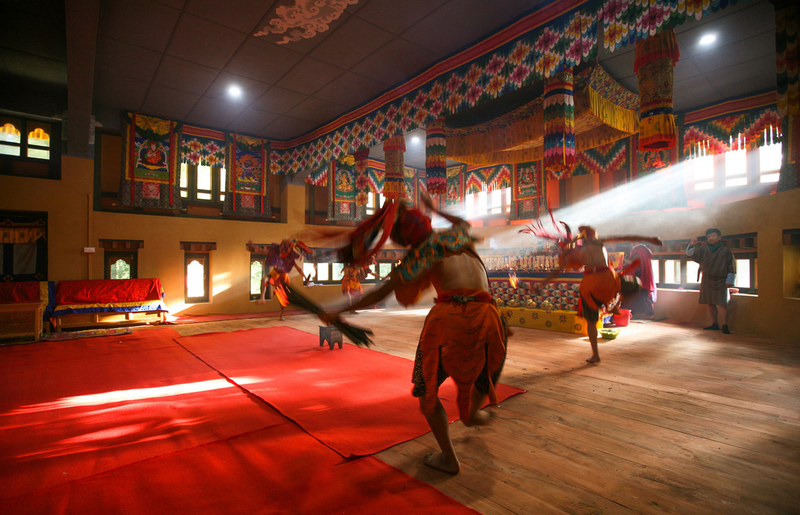 One of the more recent is the GNH Centre Bhutan. A strong economy does not connote a happy populace. Opened in October 2015 and designed by Vietnam-based 1+1>2 Architects, the GNH Centre Bhutan (recently shortlisted for the World Architecture Festival 2016) aims to demonstrate how GNH can be experienced in everyday life. GNH is broken down to four pillars: good governance, sustainable socio-economic development, preservation and promotion of culture, and environmental conservation. These pillars are articulated further into nine domains: living standards, education, health, environment, community vitality, psychological wellbeing, good governance, cultural resilience and promotion, and time use. The centre takes this palpable definition of wellbeing and uses it to inform its goings-on. A variety of programs and workshops are offered for everyone, some designed specifically for educators, business executives and CEOs, or youth, and many interdisciplinary. Most start with exercises that encourage an introspective inward glance—in order to change the world around us we often have to first change aspects of ourselves. Elements of Buddhist philosophy, like living a simpler life bereft of material goods, are explored. The centre also offers retreats into Bhutan’s forests that help one unwind and become reconnected to the natural world. The GNH Centre Bhutan and the International Conference on GNH are ways that Bhutan is sharing its philosophy with curious foreigners; the GNH survey and the index it yields are ways the country is actively, politically engaging with GNH. Bhutan’s efforts represent both top-down and bottom-up approaches; the proffered personal activities shape a solid foundation from which a larger, societal difference can grow. GNH is not a measure of subjective happiness; rather, it’s a complex standard of a nation’s enhanced wellbeing that combines a positive work-life balance, environmental conservation, optimal use of time, and more, all amounting to an autonomous definition of economy. Bhutan’s efforts are sparking a much-needed conversation in a world where the bottom line is top of mind. Photos courtesy of the World Architecture Festival via v2com.